The 2016 Leadership Series rolls on with another FREE webinar in August. Join Extension Educators Denise Stromme and Lori Rothstein as they explore tips, tools, and methods to help leaders stay invigorated and on task while wearing a number of different hats. Make some time in your busy schedule to enjoy this webinar and help yourself refresh before taking on the next big project. 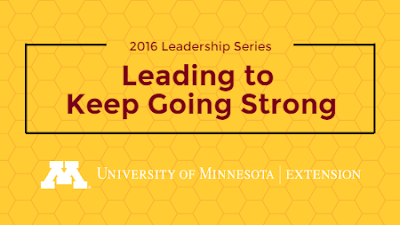 Registration is open now through August 2 at http://z.umn.edu/leadstrong.